A view from La Cusinga Eco Lodge, and some of the flora and fauna in the surrounding rainforest. All Photography: Michelle Fehler. “Maybe it’s a good thing your phone isn’t working,” I heard over my shoulder in a French accent. I’d just met Lauren amidst the flurry of activities on the first day getting settled into a weeklong adventure. At the moment I was struggling to get a bit of WiFi in the middle of the rainforest, deep in the Pacific region of the Costa Rica coast known as Uvita. It’s true, I’d come here to unplug a bit, but also to learn about biomimicry, a fascinating practice that awakened the designer, strategist and scientist in me. How wild and beautiful is the real world, in its raw, untamed reality? How can we come closer to it, connect with it, embody it? How can it help us to solve some of the world’s most pressing problems, and how could I integrate it into my design and strategy practice? “It’s probably better to leave the world behind… that way we can get in touch with the real world.” Her words hung in the air as we looked out over the forest and the ocean in every direction. The sounds of our surroundings rose up in agreement - wind rustling through the trees, crickets chirping, birds calling and monkeys howling in a symphony, even the waves crashing softly in the distance. All of life was revelling in itself here, every moment of every day. Pura vida. I’d soon come to find out that there wasn’t a quiet moment in this place - nature was always humming. It was a pleasure to disconnect from technology, but to reconnect to life, all of life - and remember that it’s been evolving and adapting to this planet for the past 3.8 billion years. What could it teach us? 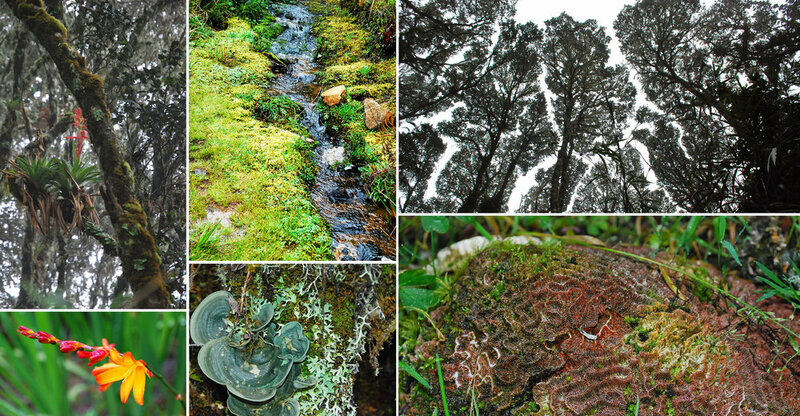 The Paramo, or Cloud Forest, at 11,000ft above sea level, has a completely different climate and set of organisms than the rainforest, coastal and mangrove regions of Costa Rica. “Emulation”: learning from living things, then applying those insights to the challenges humans want to solve. “Life’s genius”: well-adapted solutions that have stood the test of time. My curiosity in this subject led me to study it online through the Biomimicry Institute, and ultimately to explore more by heading out to Costa Rica and taking the immersion workshop, Discovering Nature’s Genius, hosted by Biomimicry 3.8. Here we would study several interlinking ecosystems over the course of about a week, observing the different organisms and their adaptations. Costa Rica is especially suited to this, as we explored everything from coral reefs, rainforests and mangroves at sea level, all the way up to the paramo or cloud forest at 11,000ft. Although each one was breathtakingly beautiful, there was another kind of beauty at play here - the genius that these organisms embodied. One of the biggest takeaways of the immersion was the fact that all life on earth follows certain "Life's Principles", or design principles from nature, such as integrating development with growth, evolving to survive, and being locally attuned and responsive. Exploring the intertidal zone, the ecosystem right at the coastline, and how the various life forms there have adapted to constantly changing water levels. Sketches from my final project: exploring the characteristics of the Ajo tree, an emergent in the rainforest, and how they can inform the development of a creative city. When not hiking through the rainforest (! ), I work with brands to develop business and brand strategy. Often it leads to discussion about their imperatives and intent. The 21st century calls for a definition of business and strategy that creates thriving cultures for people, planet and profit; I see biomimicry as one of the ways to accomplish thriving societies through sustainable business practices, product development and design. Perhaps the most eye-opening part of the training was the pure wonder of it, and how much fun it was, even for a non-biologist like me! Yes, it was hard work and a lot of great information to digest, but spending time studying nature and her genius felt like coming home in a way that I’d never experienced before, even though my native Trinidad is one of the most biodiverse countries in the world. I guess Lauren was right - we had to separate ourselves from everyday life in order to see the real world more clearly. Remembering that we aren't just observers of nature, that we are nature - that is the lesson that stays with me above all, along with the sheer optimism embedded in the knowledge that nature endures. Made with love. © Giselle Carr, 2018. All rights reserved.